As if Bristol music lovers didn't have enough going on this year here's another music festival to sink your teeth into. But this is a music festival with a difference. Pop! 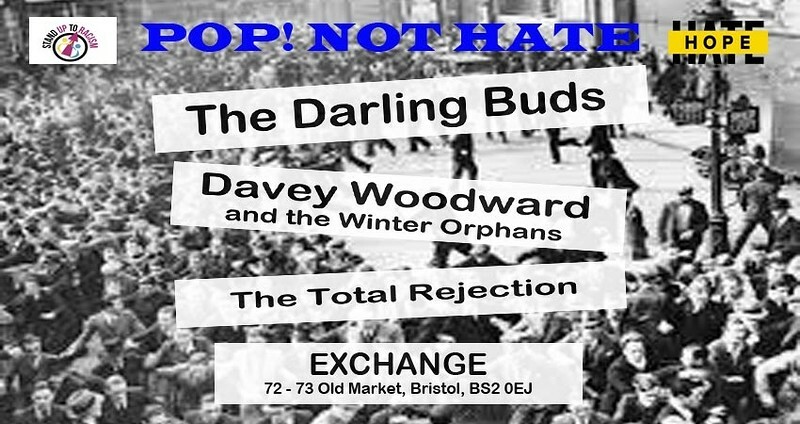 Not Hate is a series of gigs being organised to raise money for two organisations who are working tirelessly to oppose the rise of the far-right in this country - Hope Not Hate and Stand Up to Racism. Think of it as a modern version of Rock Against Racism if you will, but with indie music at its heart. The gigs are being organised by four friends from Bristol - Tim Rippington, Andrew Jarrett, Jon Kent and Rocker (Steph) Wood. These guys play in two bands, Arrest! Charlie Tipper and The Total Rejection and also promote gigs under the name Red Dust from Mars. Andrew from the Total Rejection said, "We're all deeply saddened and depressed by the way the world has been taken over by people who've learnt nothing from history!" The gigs are taking place in a variety of locations around the country, organised in conjunction with sympathetic local bands wherever possible. The focal point of it all is a five day festival in Bristol, featuring five gigs in five days at five different venues, with all proceeds after venue and a few travel costs going directly to the organisations mentioned above. Tim Rippington explained “We and many of our friends have been saddened and shocked to see the levels of hatred being expressed in our country over recent years. Racism seems to be on the rise everywhere, and a distrust of anyone who doesn’t look or think the same way. Both Hope Not Hate and Stand Up to Racism do great work in trying to combat that hatred and encourage harmony within our communities – we’re just a group of musicians but we wanted to do something to help them to continue the work that they do, and this seemed like a great way to do it”. There are shows at the Old England in Montpelier, The Grain Barge on the dockside and The Exchange in Old Market. 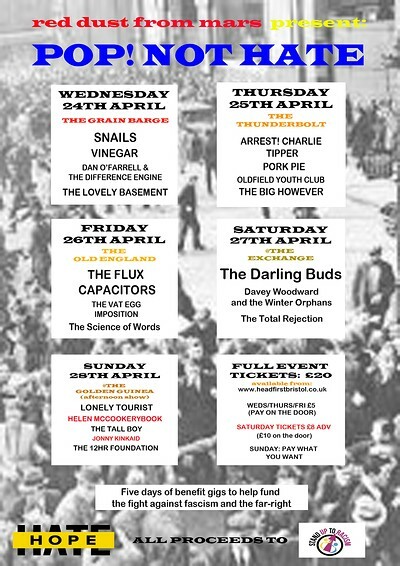 There will also be gigs at the Thunderbolt on the Bath Road and it will all come to a close with a Sunday afternoon show at the Golden Guinea in Redcliffe. There is also a major London gig taking place at The Lexington in May, with The Band of Holy Joy in the headline slot. Other than covering a few transport costs, all the bands are playing for free and were more than happy to give their time to the cause.